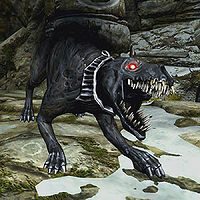 Death Hounds are creatures added to Skyrim with the Dawnguard add-on. They are guaranteed to carry a death hound collar and dog meat, as well as having a 10% chance of carrying minor loot, including leveled rings, gems, and gold. They can be found both in the wilderness, as well as interior locations such as Castle Volkihar and the Redwater Den. In any location that they are found in, there are always vampires nearby. Generally they fill the guard-dog role, often patrolling around hallways or around doorways. They do frost damage with their bite (10pt Frost, 50pt Slow) as well as having a minor frost cloak effect (1pt/sec) while in combat with them; the game describes them as having a bite "as cold as the grave". Two Death Hounds, CuSith and Garmr, can be used as followers if you side with the Volkihar vampires in Dawnguard's main questline. Death Hounds will flee if the Dragonborn is in Beast Form, even if the standard howl of terror is not used. This page was last modified on 26 March 2019, at 20:15.